Members of one of the most powerful of the old Armenian clans, whose habitation was along the slopes of Mount Ararat. Their villages and castles—of which ruins are still visible—faced Mount Ararat across the plain. They controlled the district between Erivan and Gumri—the modern Alexandropol. Moses of Chorene (fifth century) relates (see Bibliography) that the clan was of Jewish origin and came from the eastern borders of the country of the Aryans, i.e., Persia; and that they descended from an eponymous hero named Manue, after whom the Persians in his day still called them Manueans. He adds that Arsaces, the first of the Parthian kings, brought them into Armenia, and that they were in his day a powerful clan in the region of Ahmatan. The Armenian king Artashes—the mythical contemporary of Domitian, Trajan, and Hadrian—gave them villages. According to the same source, Amatuni meant advenœ, "new settlers," or, equally, "proselytes"; and it is perhaps the Persian word amat. 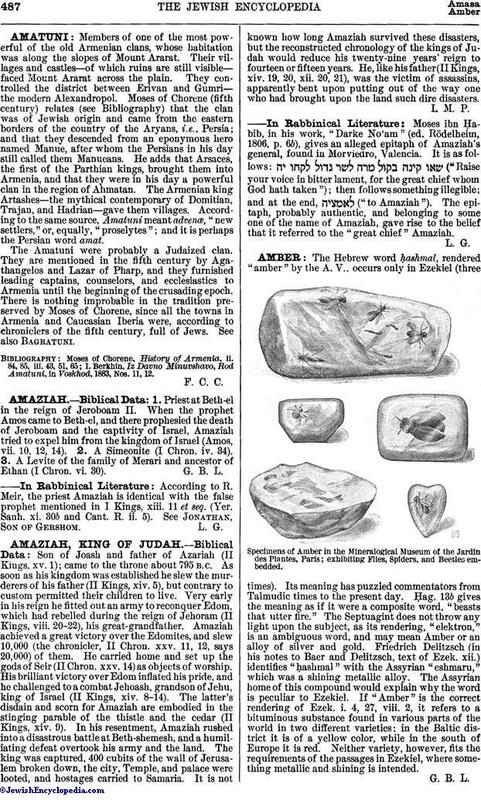 The Amatuni were probably a Judaized clan. They are mentioned in the fifth century by Agathangelos and Lazar of Pharp, and they furnished leading captains, counselors, and ecclesiastics to Armenia until the beginning of the crusading epoch. There is nothing improbable in the tradition preserved by Moses of Chorene, since all the towns in Armenia and Caucasian Iberia were, according to chroniclers of the fifth century, full of Jews. I. Berkhin, Iz Davno Minuvshavo, Rod Amatuni, in Voskhod, 1883, Nos. 11, 12.